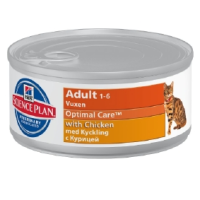 Hills Science Plan Optimal Care Adult Cat Food Tins (Chicken) has been expertly formulated alongside leading nutritionists and veterinarians to promote optimum vitality and fitness levels in cats. This delicious chicken recipe is highly digestible and kind to even the most sensitive of digestive systems, offering cat's lean protein from a single, high-quality source. Combined with enhanced Omega 3 fatty acids and clinically proven antioxidants, this special formula helps to promote a strong immune system, optimum organ function and over-all wellbeing. Hills Cat Food Feline Optimal Care Adult Chicken is guaranteed to satisfy even the fussiest of felines.